I recently received a set of Moonlight Gel Pens from Sakura. In addition to the bright colors, the fun thing about these pens they will GLOW under black light! I was excited to learn they these were recently released in a fine point in addition to the medium point that was already available. The colors work great on a dark surface. 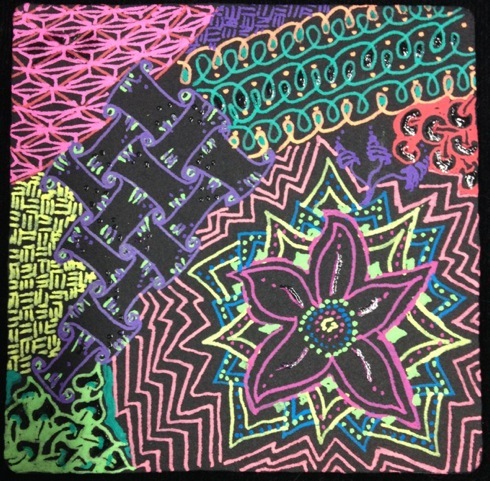 Here is the first black tile using the medium point pens. 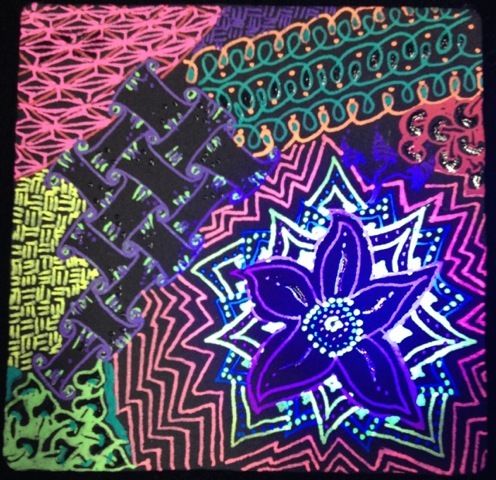 Moonlight Gel Pens – Medium Point. 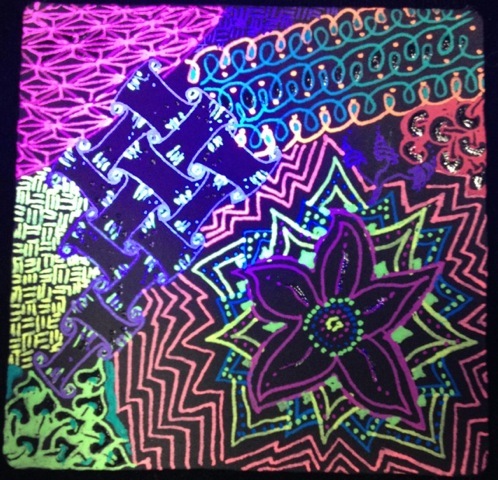 Tangled on a black tile with a black light on part of the tile. The next few pictures are of the same tile with a black light on part of the tile . . . currently I only have a small key chain sized black light thus the multiple pictures with small areas lit with the black light. Watch how some of the detail pops when hit with the light. The fine point pens are my favorite. The medium points will work well for coloring in larger spaces. Join our e-mail list to be updated on everything related to the art of Zentangle. We value your privacy. We will never provide your information to any third party, including our very own affiliates such as Cafe Crop. Wrap it up and put a Ribbo on it! ©2019 Tina's Tangles. Powered by the Get Noticed! Theme.